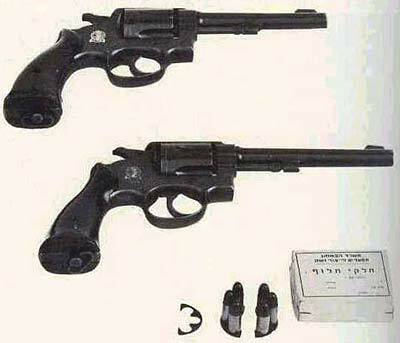 Surely the first ever firearm produced in Israel. Made since the '50s, the IMI M-1917 revolver takes its name, and borrows its design, from the American SMITH&WESSON 1917 revolver in .38-Special. The IMI revolver by itself was chambered for that cartridge, later them were converted, both cylider and barrel, for the 9x19mm-Parabellum. Out of production and out of duty since long time now, the IMI MODEL 1917 revolver feeds from half-moon-shaped "ante-litteram" speed-loaders, with a 6-rounds total cylinder capacity. It exists in both 4" and 6" barrel length.